“If you find yourself alone, riding in green fields with the sun on your face, do not be troubled. For you are in Elysium, and you’re already dead,” says Russell Crowe’s Maximus in the 2000 blockbuster Gladiator. 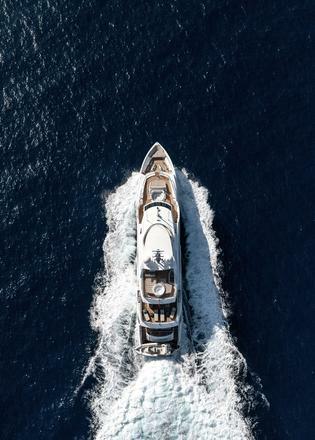 And so ran the thinking of Ron Gibbs when he named his Sunseeker 131 Elysium, after the Ancient Greek concept of a heavenly paradise. His list of custom features was long and detailed, with a first draft extending to 120 pages. And it drilled down as far as details such as not using push-in power sockets behind the bridge console – he’s had problems in the past with plugs rattling loose, requiring major surgery to access. “Why would you use a push-in fitting on a boat that is subject to vibration and movement?” he says. By the end of the build, they were on version 11 of the document. Many of the changes boil down to just two things: Gibbs’s love of taking the wheel himself and his preference for a big tender. “I like driving the boat myself and I like being in the open air. 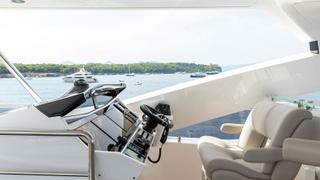 I didn’t want to be in the same situation as with the Sunseeker 115, where you have to run between the sundeck and the bridge.” He specced a fully functional helm station up under the hardtop with an unparalleled view ahead. Literally every function on the bridge is replicated up here, from chartplotters to FLIR night-vision cameras and even the Bridge Navigational Watch Alarm System that spots when the helmsman has nodded off – a requirement of coding. To complete his eyrie up in the fresh air, Gibbs wanted to put a new companionway in to connect the main bridge and the sundeck helm. This, in turn, meant extending the large fibreglass hardtop, to protect the stairs. 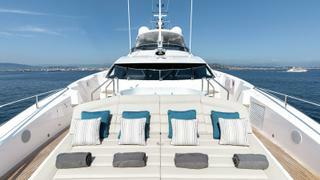 “On the 115, you got drips from the hardtop going down the companionway. Every morning, the guys would be out with sponges and a chamois to clean it up, then 15 minutes later the water would be back. 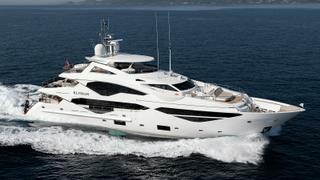 Sunseeker made me a whole new mould for the hardtop and there was no extra charge for that. They could not have been more helpful.” It now appears as an option for the 131. 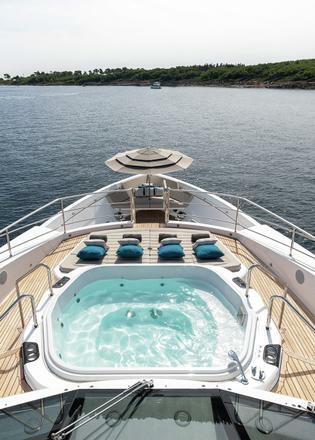 The bigger roof needs a couple of stainless steel pillars to support its leading edge, and that has meant reconfiguring the forward sundeck area as well – all knock-on consequences. The spa pool that would usually sit here has been moved back behind the bar area. In its place, the sunpads have been extended to provide cover for raising the deck beneath, increasing headroom in the gym. 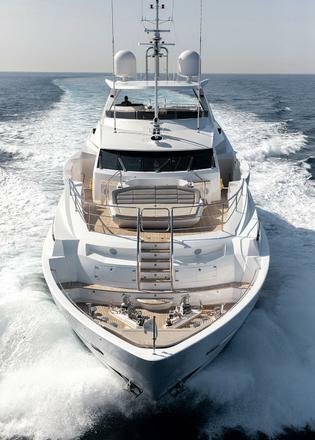 To finish the job, he had a custom mast put in forward with a bit of extra height that puts the yacht’s steaming light out of sightlines above the edge of the hardtop. “Otherwise you’re blinded by it for night sailing,” he says. Also, the elegant sweep of the bar up here has also been enlarged to make it a really convivial space for pre-dinner drinks. On the standard 131 layout, stairs come up from the main deck to give access to the bridge, the skipper’s cabin to starboard and a pantry and dayhead to port. 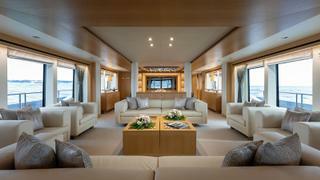 They also lead to a large saloon aft with sofas and a bar. This page of the general arrangement has been torn to shreds. 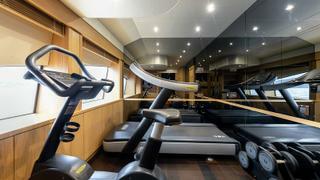 The stairs have been rerouted and the cabin turned into a gym housing bikes and cross-trainers. Meeting Gibbs, all six-foot-plus of him, it is suddenly clear why the deckhead above had to be raised. Gibbs’s view is that you only need one interior lounging area since you spend most of the time outside. There may be another strand to his thinking, though. Uniquely, Elysium is run without cooking on board. 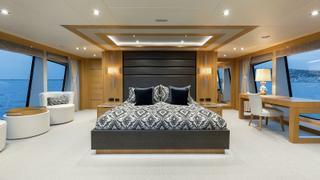 Oh, it’s got a galley (complete with two ovens, a microwave, four fridges and two freezers) – you wouldn’t build a 40 metre yacht without one unless you had no thought for its resale value. 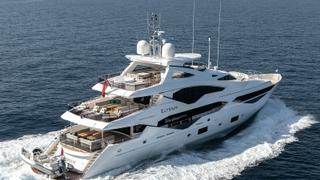 But Gibbs organises life on board so that hot meals are always taken ashore – for crew and guests alike. 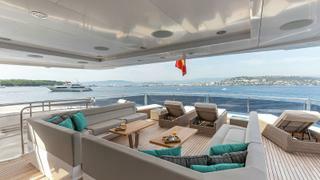 The galley is just used for preparing occasional snacks, breakfasts, sandwiches and so on. “Trying to get cooking smells out of a boat with curtains is very difficult. It ages a boat very quickly,” he says. “Then there’s the time it takes to get food on board and waste off. And however good your chef is, after two weeks on board, you become pretty bored with what they do.” It is too comprehensive an argument not to have been well rehearsed with other sceptics. The point is that it works for Gibbs and his family. I open one of the ovens to confirm that the crew doesn’t occasionally sneak a cheese toastie past the boss, but it contains only the original instructions, still in plastic. “Ask most of my family what the dishwasher’s for, and they’ll say ‘To store the crisps.’” This strategy also has the benefit of freeing up the neighbouring dumb waiter area for use as a laundry room. The other big area of change is around the transom, where skipper Chris Averis leads me next. A small 4.3-metre Ribeye tender lies lengthwise on chocks in the garage, alongside two Sea-Doo personal watercraft, Seabobs, inflatable kayaks and two inflatable Nautibuoy platforms. In short: lots of toys, but not a boat capable of getting guests from the boat to dinner ashore dry and unruffled. The skipper estimates that he can have the tender deployed in 90 seconds. “Plus we gain an entire extra RIB.” He admits that when entering a busy port, they may choose to first remove the tender before jostling into a berth. And using a bigger tender means they had to beef up certain stanchions to support the weight of a boarding ladder. The extra weight could have been a problem, but in fact it is very nicely offset by an extra tonne and a half of chain and anchor at the bow. “She balances up nicely on her lines,” Gibbs says. This leaves the bow free of the rescue tender and davit that it would otherwise house, and this extra real estate has been put to good use. Gibbs has planted a plunge pool module here, with sunbeds and half a dozen big speakers. In the event of a sale, it can just as easily be returned to its standard use for storing a rescue boat in order to meet classification rules. “There were a lot of the standard ‘hidden’ components installed, such as crane sockets, wiring, plumbing and deck plates to make retrofit a lot easier,” says Chinery. There are steps down to the bow, where the vast Lewmar capstans gleam like sculptures. In one of Gibbs’s final tweaks, the tip of the bow has been filled in and upholstered, with a lug for rigging a parasol. “This is one of my favourite places,” he says. “Sitting on the edge of the foredeck, out of the wind.” Here, then, is the man’s true Elysium – his paradise within a paradise.